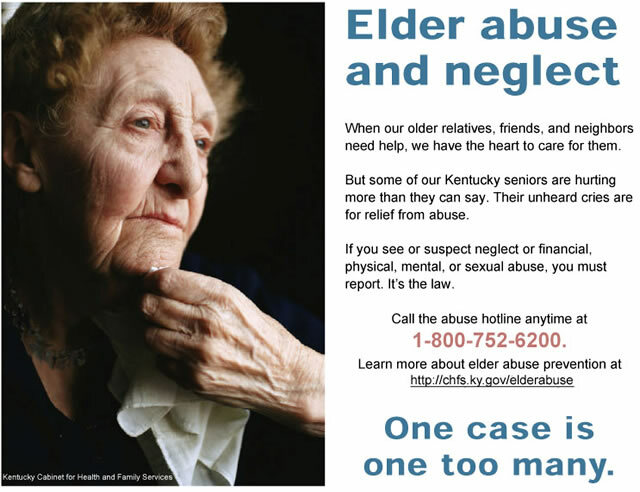 This poster from Kentucky highlights one of the major differences in Kentucky's approach to Elder Abuse compared to Ireland's. In Kentucky everyone is a Mandated Reporter by law. If Elder Abuse is suspected, the law requires it to be reported. Another huge difference is that Kentucky has put into place the infrastructure to deal with Elder Abuse, including the establishment around the State of Elder Abuse, Neglect, and Exploitation Forensic Centers. There are also specially trained, designated Public Prosecutors to deal with Elder Abuse. We note that no one in Ireland is required to report Elder Abuse and there are no specific laws aganst Elder Abuse in Ireland. There are no Mandated Reporters for Child Abuse, either. The first Irish Government report on the pervasive child abuse existing in Ireland as a free state was made in 1931 and in the typical Irish response was immediately squashed, hidden from view, and never dealt with. Saoirse Maxwell was gratified to receive a letter from Joseph M. Bowe, Dolores' solicitor and co-Executor of Dolores' estate, days after notifying Beauchamps Solicitors' Managing Partner of a few of the serious issues surrounding the administration of Dolores estate. Not at all gratified by the contents of the letter (which we explored in An Open Letter to John White Part 2), but because it appeared Mr White had exerted his influence on Mr Bowe to compel him to finally respond to her and her brother. Perhaps Mr White would help seek justice for Dolores. With that hope, Saoirse sent two additional letters to John White. We publish those letters on this page. However, subsequent to those letters to John White, new information concerning the administration of Dolores' estate has come to light, as we find that at least one of the executors is using the proceeds of Dolores' estate to pay his personal liabilities. Furthermore, it seems one of the executors is claiming expenses and being “reimbursed” for items that Dolores paid for (or was forced to pay for) months before she died. We know who is doing this, the times these items were purchased, what the items were and where they were purchased. We don't report this cavalierly. Nor do we report it without clear and unambigous evidence. It is well supported. We consider this to be nothing less than the continued abuse of Dolores Maxwell. She was marginalised because she was a woman in Ireland. She was further marginalised, isolated and abused as she became an old woman in Ireland. Now that she is a dead old woman in Ireland, it seems they just can't stop. It seems that the administration of Dolores' “insignificant” estate (as Mr Bowe refers to it) has been rife with difficulties. Mr Bowe swore under oath that it is his opinion that it is impossible to administer Dolores' estate because of Saoirse's “conduct.” We note he offered no examples or evidence that we can identify. We find ourselves in disagreement with Mr Bowe's assessment. Perhaps these difficulties are rooted elsewhere. Considering the following, maybe there is a conflict of interest present. That would certainly present difficulties. Representing two parties in the same transaction where a substantial transfer of wealth occurred from his clients Dolores and Cecil Maxwell to his client Ethan Maxwell after receiving information from three different sources that Dolores and Cecil were acting under undue influence and coercion. Aiding and encouraging his client Ethan Maxwell as he attempted to have his elderly client Patrick Maxwell named a Ward of Court, with Ethan Maxwell having control over Patrick's affairs and assets, despite the fact that his clients Cecil and William Maxwell (Patrick's only immediate family) were willing and able to do so, and in fact had been named as exectutors in Patrick's will. Mr Bowe's refusal to address the fact of his client Ethan Maxwell's unauthorised use of his client Dolores Maxwell's credit card. We note that because of that refusal, Dolores' “insignificant” estate is left to literally pay for the crime of his client Ethan Maxwell. Mr Bowe's refusal to seek Dolores' financial records. Mr Bowe of course had stated to Saoirse many times that once the Grant of Probate came through, he would request and give authority through the Executors to Saoirse to get those records. Of course that would put at risk his client Ethan Maxwell even as money was returned to Dolores' estate. In fact, it appears that any time the interests of his client Ethan Maxwell conflict with the interests of another client, Ethan Maxwell is deferred to. Of course, when this leads into conflict with the interests of Dolores' estate and her nine beneficiaries, Mr Bowe defers to his client Ethan Maxwell at the expense of Dolores' estate and her beneficiaries, who are also Mr Bowe's clients. At least five of Dolores' beneficiaries have raised their concerns with Mr Bowe about a conflict of interest in the administration of Dolores' estate. It must be noted of course that Mr Bowe adamantly denies any conflict of interest has ever occurred. Joe:	…if the document goes through, yes, I'll look after everything on behalf of your mother. Joe:	(Unintelligible) …totally acting in your mother's interests. Joe:	…I can ask for bank statements, etc., and pursue as much as you want of that. Joe:	And I don't have a conflict of interest, I mean it's not as if I'm going to find something I'm not going to tell you or wouldn't pursue it 'though I should, once I get this registered. RE: Your late mother Sale Redacted, address of Dolores' house. I refer to your e.mail of 17th December. I completely understand your instructions in the context of the letter your sister Saoirse sent me. However, her letter is misleading and a distortion of the facts. I am one of the Executors of your mother's Will. Currently, I am also the Solicitor dealing with the administration of her estate. I have to act solely in the interest of the beneficiaries. There is no conflict of interest. If there were, I would immediately cease acting in the administration. Notwithstanding all of the above, and largely as a result of the complaint which your sister made to the Solicitors Disciplinary Tribunal arising out of my alleged misconduct, it is proposed that the Executors should now appoint "outside" Solicitors to complete the administration of your mother's estate (including the sale of the house). If nothing else, this would make it easier to distinguish between acts undertaken by me as one of the Executors and my conduct as a solicitor. The Tribunal has no authority to enquire into the former. [Editor's note: It's worthwhile to look at Saoirse's response to Mr Bowe's assertion that there has never been a conflict of interest. View her Further Affidavit, Paragraphs 132–142. We think any reasonable person would question whether a conflict of interest exists here, although we note that the Solicitors Disciplinary Tribunal didn't seem to think it was an issue. The complete decision of the SDT. Perhaps a source of both the difficulties in administering Dolores' estate and Mr Bowe's contention that there has never been a conflict of interest is his belief that the beneficiaries are not his clients. 13. In Section 4 paragraph 3 of the Applican't Affidavit, the Applicant claims that I “failed to respond to client's correspondence or questions”. The Applicant is not a client of Beauchamps, as indicated in paragraph 9 hereof. 36. In Section 3 paragraph 4 of the Applican't Affidavit, the Applicant alleges that I misled the Applicant [this benficiary/client] on several occasions. The Applicant has not produced any evidence to this effect and I completely deny any suggestion or claim that I misled the Applicant. As pointed out in preceding paragraphs, the Applicant is not a client of this firm. Mr Bowe's assertion that Saoirse and by extension the other beneficiaries of Dolores' estate are not his clients is interesting, although problematic and untrue. In a High Court case in 2010, a solicitor/executor argued that a beneficiary could not lodge a complaint him because she wasn't his client. He argued that his only client was the executor of the estate, and not the beneficiary. As the judge pointed out, that would produce the bizarre outcome that the solicitor (as executor) would be the only person who could make a complaint about the services he was himself providing as a solicitor. “The definition of “client” in S 2 of the Solicitors (Amendment) Act 1994 must include beneficiaries of a will, where the solicitor is the executor, so that a beneficiary obtains all the protections under the Act which any other client of a solicitor would obtain. …the whole point of the definition in s.2 was to ensure that a solicitor could not argue that he was non-accountable to beneficiaries in respect of services provided to them. If the applicant's arguments were correct, the obvious consequence would be that, although the Act defined the beneficiaries as clients, they would have no recourse to his professional body were he to provide inadequate services. That would produce the bizarre outcome that the applicant would be the only person who could make a complaint under s.8 about the services he was himself providing as a solicitor. That, Mr. Coffey submitted, would be an absurd interpretation of the statutory provisions and would entirely defeat the whole point of defining beneficiaries as clients in s.2 of the 1994 Act. In addition, the fact that in law the beneficiaries are entitled to apply to have the applicant removed as executor simply copper-fastens the fact that he is acting on their behalf and the fact that he asserts that he is instructing himself cannot alter that. The logic of defining beneficiaries as clients is that, for the purposes of the 1994 Act, the solicitor must be treated as though he were taking instructions from them. The definition of “client” in s.2 of the Act of 1994 not only addresses the usual position of a person who by giving instructions to a solicitor becomes a ‘client’, but, much more significantly, extends the definition to include a beneficiary to an estate under a will, intestacy or trust. This provision, in my view, is deliberately framed to cover situations where solicitors are acting in the dual capacity of executors and solicitors, because, absent such a provision, a definition confined to the ‘normal client’ would mean that an executor solicitor could not be held accountable to beneficiaries in respect of services which he provides to them. As has been pointed out, the logic of the applicant's argument would lead to the consequence that beneficiaries would never have recourse to a solicitor's professional body in situations where he provided inadequate services. This in my view would entirely defeat the whole point of defining beneficiaries as clients in s.2 of the 1994 Act. …the wider definition of “client” as contained in s.2 must necessarily be the correct one. The sole purpose of the work which the applicant was doing was to benefit the beneficiaries. In my view the clear and obvious purpose of s.2 – and the fact that a beneficiary is therein defined as a client – is to ensure that a beneficiary obtains all the protections under the Act which any other client of a solicitor would obtain. I am also satisfied that the purpose of the 1994 Act is not to create two classes of clients, namely those who can make a complaint about inadequate services and those who cannot make a complaint about inadequate services. It would be absurd to have a situation whereby the beneficiaries would be entitled to have the applicant removed as executor on application to the Court, but were powerless to advance a complaint to the solicitors' professional body. They are the persons for whose benefit the professional services are provided. In my view, on the interaction of s.2 and s.8, the definition of client contained in s.2 must prevail. I simply do not accept that the Act is designed to ensure that where a solicitor is acting both a executor of the will and solicitor that he is in consequence to enjoy an immunity from the provisions of s.8 of the Act of 1994. And of course, Mr Bowe's thinking on this matter is also completely at odds with the Law Society. 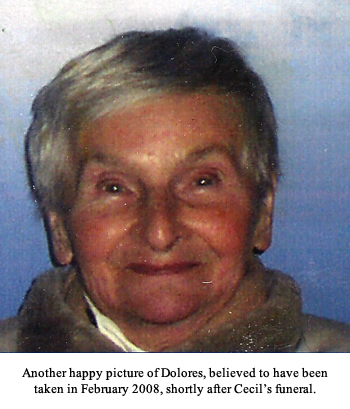 We sincerely hope that solicitor/executor Bowe's claim that Dolores' beneficiaries are not his clients is made from ignorance, and not some vague notion that his belief trumps the law, the High Court, The Code of Conduct and the Law Society. We just don't know. We note that the Solicitors Disciplinary Tribunal seems to have no issues with Mr Bowe's stance on this. Joe: …I will facilitate you 100 per cent. Excuse us for pointing out the obvious, but, but, Mr Bowe, it's not his will, it's Dolores'!!! Joe:	There was a letter given subsequently and I put it here in the file, I mean it's not, it was typed up and your mother wasn't a typist and she certainly she was, she wasn't an accurate typist. Nathaniel:	That would be prudent. Saoirse:	Yeah. When did that come? 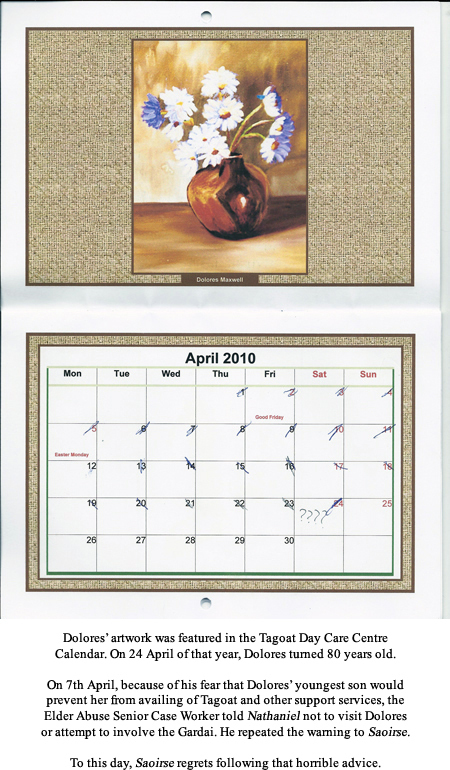 Joe:	It would have been June, sorry May 2009. Saoirse:	Yeah. She, that's, that's his. Nathaniel:	He definitely has a part in it somewhere. Geoffrey:	(Unintelligible) …because it seems that everything that happened regarding your mother was his making. Geoffrey:	If he wasn't happy with this it would have never have happened. Nathaniel:	That's, that's what bothers me. Geoffrey:	Why is your mother saying, look, I don't want them, because obviously unless she had in some way fooled him and told him, you know, (Unintelligible) makes some arrangements and once she was in your office getting (Unintelligible) inserted. Geoffrey:	I, I don't think so. I think this is with Ethan's knowledge and he was behind it, so. Joe:	…that if he actually put that in it was just going to look very, very odd, and I might have had concerns about it. I don't know. We could go on with more examples of this apparent confusion over the legitimacy of a solicitor's client issuing instructions to him for another client, but we think the above examples suffice. For more examples refer to Saoirse's Further Affidavit, Paragraphs 143–150, and Paragraphs 155–169. Our analysis above of the possible reasons why this “insignificant” estate seems so difficult for the professional administrative team of solicitor/executors Joseph Bowe and John Cunningham (with nearly 60 years experience between them doing this work at Beauchamps) raises many more questions than it answers, we fear. It is exceedingly curious. And oh yeah – the Solicitors Disciplinary Tribunal appeared to have no issue with this. Thank you for your efforts that resulted in a letter to me from Joe Bowe, which I received 20 December. Joe has described Mom's estate as “insignificant,” and I thought nearly five months would be plenty of time to administer these final items in Mom's estate. I am enclosing a copy of Joe's Dec. 19, 2012 letter, quoting mine to you of Dec. 13, 2012. He states that “I know nothing about the matters referred to. Could you please supply details now.” I am baffled at why he would blatantly lie like that. Sadly, however, I am not surprised. Joe has lied to and misled me repeatedly. This fact is undeniable and provable. I am enclosing a letter from me to Joe Bowe dated 09 January 2012 regarding the fraudulent charges for a headstone lodged against Mom's estate, and emails from some of my siblings to Joe concerning this, dated 09 January 2012. Joe's response to me is also included. In it he states his intention to not answer any of my correspondence. He never did address the headstone issue. He's known about it for almost a year now. In Joe's letter to my brother Sean dated 19 December 2012 he once again denies any knowledge of these affairs. I have enclosed Joe's letter, Sean's response, and two examples from earlier this year where Sean sought clarification from Joe about these very same matters. I am also enclosing my Responding Affidavit to the Solicitors Disciplinary Tribunal, sworn in January 2012, shortly after my letter to Joe informing him of the headstone matter. It details some of the irregularities in Mom's estate and finances that he has known about for years. My complaint to the Tribunal is extensively supported with documents and recordings. I do not enclose these exhibits here, but would be happy to provide you with them. Then again, both Joe and John Cunningham, as the Respondent Solicitors, were provided complete copies by the Tribunal. Regarding the headstone, Revenue CA24 form, and other irregularities, see paragraphs 112 through 131 of my Responding Affidavit. The Probate Office assures me no Corrective Affidavit has been filed. Regarding Joe repeatedly lying to and misleading me: see paragraphs 95 through 111, and paragraphs 203 through 214 of my Responding Affidavit. Of course, Joe not only lied to me and my siblings, but perjured himself to the Tribunal, and along with his co-executors, to Revenue. That is self-evident and undeniable. My affidavit also details the explicit conflict of interest that Joe has maintained for years, to this present day. Please see paragraphs 80 through 94. You can understand why I hesitate to respond to Joe. He has violated my trust so thoroughly that I feel it prudent to rely on nothing he says, unless I can solidly and independently verify it. His latest letter certainly confirms the rightness of that decision. If he told you the same things he stated to me in that letter, he lied to you also. The final document I have enclosed is a copy of a letter to my brother letter to my brother Conor, which Conor provided me. This letter was written shortly after Conor and his family tried unsuccessfully to visit Mom in August 2010. It is written on Beauchamps' letterhead. Joe stated to me that this letter issued from Beauchamps, although he refused to say on whose instruction, or even who signed it. Can you tell me who issued this threatening letter and on whose behalf? Personally, because of the nature of this letter, and the fact that there are over a dozen anomalies that distinguish it from any other correspondence from Beauchamps I have ever received or seen, I find it hard to believe that it came from Beauchamps. It has all the hallmarks of Joe's client and co-executor, Ethan Maxwell. Ethan Maxwell Maxwell has a history of forging documents, including posing as a solicitor. Joe is aware of this history. I note that Joe was provided a copy of this letter to Conor in September 2010. Mr White, my parents relied on Beauchamps for decades. As did my uncle Patrick Maxwell, and my Grandfather, at least as far back as the early 1980s. I do not believe my uncle and parents received the professional service they expected, deserved, and paid for. I cannot help but question the level of service my co-beneficiaries and I are receiving from Beauchamps. Please be aware that I have barely scratched the surface of the many troubling things that surround Joe Bowe and Ethan Maxwell Maxwell concerning my uncle Patrick Maxwell, my father Cecil Maxwell, and my mother Dolores Maxwell while they were trusting clients of Beauchamps. I haven't talked about Mom's current will that was made two days after making the previous one, far away from the offices of Beauchamps. I haven't referred to the witnesses to the current will, one who stated that he did not sign or had ever seen that will, or the other witness who could not recall if Mom signed it in her presence. Joe is aware of all this. Although Joe stated to me that he was unaware of any previous wills, evidence suggests that there were four (possibly five) wills made by my mother in an 18 month period following the death of my father. Once the timeframe for filing a caveat had passed, Joe spoke of a “number of wills” made by my mother. I haven't talked about the fraudulent charges made on Mom's credit card while Mom lay unresponsive and dying in the hospital. These were made by Joe's client and co-executor Ethan Maxwell. Both Joe and the financial institutions involved have assured me that Mom was the only one ever authorised to use her credit card or ATM card. I have provided Joe incontrovertible evidence of this fraud. He has never explained why he refuses to even try to have these funds returned to Mom's estate. What other questionable charges are on Mom's credit card? What about her ATM card and burned bank statements? What about mom's other finances? Mr White, I could go on and on. This is but a brief overview. I am restraining myself here. When I realised in December of 2009 that Mom was being isolated and abused by Ethan Maxwell, I did everything I could to get her help before it was too late. I failed. Since her death in 2010, I have sought justice for Mom and accountability for those who treated her so horrifically. I will continue to do so. I hope that I can count you – Mr. White – or someone in Beauchamps' management as an ally. Rest assured Joe Bowe's efforts as an employee of Beauchamps to discredit me, lie to me and facilitate Ethan Maxwell in these crimes are not being met with quietly. Further to my registered letter to you of Jan. 2, 2013, can you please advise what steps if any, you as Managing Partner of Beauchamps Solicitors, or Beauchamps Solicitors plan to take. I am kindly seeking a written response by 5 pm. Jan 31, so I can consider further steps in this matter. We look at John White's Response on the next page of the Open Letter to John White series.